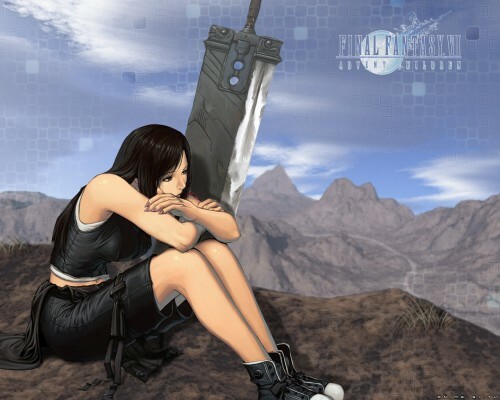 I think I found the stock image of Tifa here... don't remember >_<. A few days went into this, and I hope no one has walled this image yet... though they probably have due to my slow walling abilities >_<. Thanks for your time, and please enjoy ^^! OO i really like the sword added to this wallpaper. It looks great, and has a nice effect on the overall feel of the picture. Great work! Great stuff! Love the work on the landscaping. However, I think it would be better if the BG were a little, err, sketchier (artsier?). Seems kinda weird (at least to me) with a cel stock and a 3D bg. However, again, GREAT rendering. wow , how nice wall . TIFA is so wonderful . awesome job riku! the tech stuff looks fantastic. ahh the mountains~ terragen <3 keep it up! I had to stop reading your comment when it looks like you were about to describe a scene. This is another reminder I've not watch FF7:AC yet. It looks so clean and sharp. And the boxes nicely distinguishes this wallpaper from any other. This is so sweet! I've loved this picture, ever since I first saw it on nekkeau's site ~ and that was before the film was released, so no-one really knew at the time that the Buster Sword was being used as a memorial to Zack at that stage. Beautiful picture! Tifa is drawn very nicely and the art is fantastic! tifa is sOoOoOo much more prettier than aeris! don't u guys agree? perfectly done. XD nice combination! the sword! the sword! I love the sword! and the background is just so rite....... :) Thank you for your work!